As the description for this forum says, each BOINC project publishes their news items in an RSS feed. This makes it easy to gather them all in one place, which is what I'm attempting to do here. Unfortunately, it seems that they don't include the project name in the news item titles, so we end up with titles like "Project news for Feb 15, 2006" (project info is included in the bodies). That just won't work if we're going to have half a dozen or more projects' worth of news items here. I'll try to figure out a way to have the project name inserted into the title. In the meantime, updates will be intermittent as I mess around with it. Once I get that figured out, I'll add the feeds for the other projects and automate the process of updating. I haven't decided whether I want to allow replies, or keep this to simply a news forum, so for the moment, I'm going to leave it open to replies. Please, try to keep any discussion on the topic of the individual news items, or about this whole experiment itself. UPDATE: AthlonRob showed me how to get the project name inserted into to the topic title. There is one slight issue at this point - if the project posts more than one news update in a given day, the rss reader will only grab the first one. That shouldn't be a huge issue, so I'll work on fixing that later. I'll add the rest of the DC-project news feeds that I know about later tonight. I'm sure I'll miss a few, so if there's a project news feed that you'd like included, let me know. 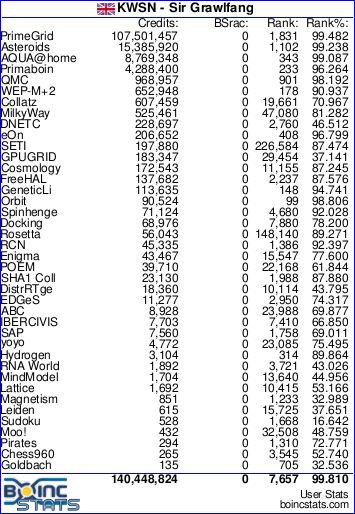 I've added the RSS feeds of every BOINC project listed on our BOINC stats plus uFluids and Leiden Classical. If there are any other DC projects out there with RSS newsfeeds that you would like to see added, please let me know. The news is set to be retrieved once an hour 15 minutes after the hour (4:15, 5:15, 6:15, etc). Nothing yet from Planetquest that's one project I'm waiting to see get moving. So I can regain the functionality of "new posts since last visit" for myself, I've created a new account "KWSN - News" which will be posting all of the DC news from now on. Creating a another post ho? CPDN has an invalid character "&" in their RSS feed. Since they were the 3rd feed in the list, this was preventing all the other feeds from updating. I've deleted CPDN from the list for the time being. If someone wants to contact the powers that be at CPDN and get them to fix their feed, that'd be great. Don't suppose there's any chance of this being updated to include the 25 or so projects it's missing? You may have noticed the small update to the number of projects in the RSS list. I tried to add Cosmology@Home as well, but their feed isn't valid xml. Since that causes the feed reader to break, I left them out. I also updated a few of the older projects with the current locations of their feeds. Cosmology fixed their rss, so they've been added. Milkyway@Home added. No word on Snickers. I had to delete SZTAKI - they've got invalid RSS and it's causing the importer to crash. There's a blank line at the start of the XML file. Can somebody who's active on that project contact the admins and let them know? This bug is also why there's a massive influx of news - the crashing was preventing the other news from being imported (since December 24).